Northern Ireland picked up their first competitive victory since September 2017 by easing past Estonia 2-0 at Windsor Park. 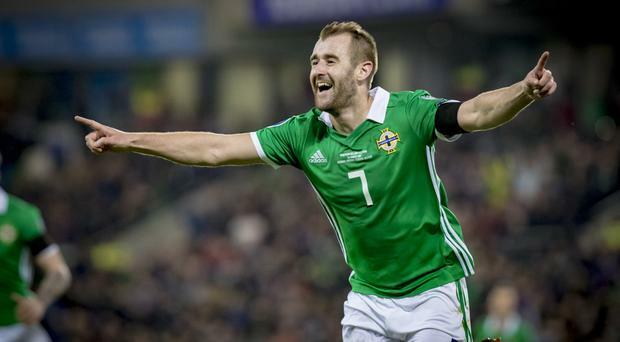 While Rangers-bound Jordan Jones starred, it was Niall McGinn and Steve Davis who provided the goals to get NI's Euro 2020 qualifying campaign off to a winning start and earn their first three points in nine competitive matches. Both goals came in the second half as Northern Ireland deservedly struck to ease nerves after failing to score in eight of their previous 12 games. McGinn showed desire to smash home his fourth international goal while captain Davis stroked home from the penalty spot. Northern Ireland had failed to make their sheer dominance show on the score-sheet before the break, some perhaps fearing the 2018 frustrations could continue. The game had been played almost exclusively inside the Estonian half but Paddy McNair and Craig Cathcart couldn't make the two best chances count. McNair was first up when one of his dangerous runs from deep allowed him to get on the end of the starring Jordan Jones' cross but, from point-blank range, he headed the ball down into the ground and it bounced agonisingly over the bar. Cathcart's chance was another header, this one from Niall McGinn's right-wing cross but, although his header looked goal-bound, it lacked the pace to beat Sergei Lepmets. The deadlock was finally broken on 55 minutes and it came, with no surprise, from a typically dangerous Jones cross. It was taken down expertly by target-man Kyle Lafferty who did well to tee up McGinn, his shot blasting past a helpless goalkeeper as his desperation made sure Paddy McNair didn't beat him to the strike. Goalkeeper Bailey Peacock-Farrell had little to do, such was the dominance of his side's display but on the one occasion he was called into major action, he passed the test with flying colours. Shortly before Davis doubled the lead, Estonia substitute Gert Kams set star striker Henri Anier running clear but the Leeds stopper was out quickly to deny. He was rewarded just three minutes later when midfield runner George Saville was hacked down with a late challenge in the box and Steven Davis smashed his penalty straight down the middle for his 12th international goal. Northern Ireland will look to make it two wins from two when Belarus visit Belfast on Sunday (kick-off 7.45pm). In Group C's other game, the Netherlands smashed Belarus 4-0 with Liverpool duo Virgil Van Dijk and Georginio Wijnaldum on the score-sheet.